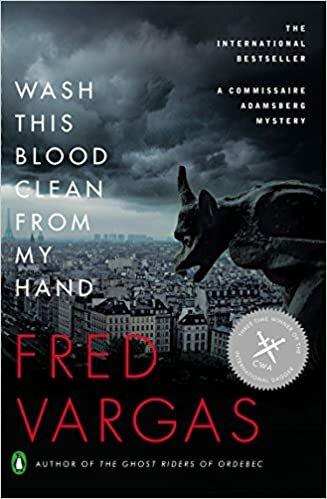 I bought Wash This Blood Clean From My Hand by Fred Vargas for two reasons: I really like her Commissaire Adamsberg mysteries, and my library didn't own a copy. Plus, I found a really cheap used copy from Powells. But I don't know why I then let it languish on my shelf for years, without once picking it up to read. And I mostly picked it up now because it fulfills one of my Backlist Reader Challenge reads. But also because I really do like the way Fred Vargas writes. Especially when she's writing about Commissaire Jean-Baptiste Adamsberg. Adamsberg is the head of the Serious Crime Squad in Paris. But he's not your typical police officer. He gives off a "dreamy indifference" when he's solving a case that sometimes drives the other members of his squad crazy. At the same time, he makes these intuitive leaps and notices these unexpected connections that no one else ever sees. His unique talent means he solves a lot of cases...and it also makes for some very offbeat and imaginative mysteries. I like them a lot. In this one, Adamsberg is chasing a murderer he once dubbed The Trident. "The murderer who always escaped, and who, thirty years earlier, had thrown his life off course ... no other living being had caused him more pain and dread, distress and fury than this man." Now there's a new murder and Adamsberg is convinced that The Trident is back. There's just one problem. The man Adamsberg knew as The Trident died sixteen years ago. Adamsberg even went to his funeral. It's a definite complication...and not the only complication Commissaire Adamsberg encounters in this compelling mystery. I shouldn't have waited so long to read this one. Then again, it was definitely worth the wait. Ooh, that sounds really intriguing! Glad you enjoyed it. Vargas is a great writer! I've enjoyed all the books of hers that I've read. That is one. freaky. cover. :) It sounds like a good read, too. Commissaire Jean-Baptiste Adamsberg sounds like an intriguing character. I don't think our library has this series, bummer. Maybe have to check out the used bookstores. I haven't heard of this series before, but it sounds like one I'd like. I'll have to check it out. Thanks, as always, for the great recs!